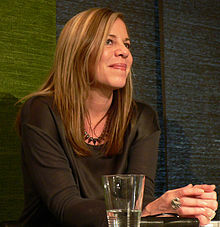 Alyson Noël is an American author from Orange County, California. Alyson Noël was born on December 3, 1966, raised in Orange County and attended Richard Nixon Elementary School for two years. She is the youngest of three girls born to her divorced parents. She lived in Mykonos, Greece after leaving her high school, Troy High School. Afterward, she moved to Manhattan, New York where she worked as a flight attendant for Delta Air Lines. She now lives in Laguna Beach, California. She has had a variety of jobs such as babysitter, department store sales clerk, administrative assistant, office manager, jewelry maker, T-shirt painter, and front desk hotel clerk, in addition to flight attendant and considers herself an author. She was inspired to become an author after reading Are You There God? It's Me, Margaret by Judy Blume, in the sixth grade. Her first book was the young-adult novel, Faking 19, which explores the lifestyles of teens today. On March 28, 2011, Alyson Noël announced that all 10 books in both The Immortals and The Riley Bloom series have been optioned by Summit Entertainment. On June 28, 2012 Alyson Noël stated on Twitter that all 4 books in the Soul Seekers Series have been optioned for film by Cheyenne Enterprises. On September 9, 2015, Noël tweeted that there will be a future film adaptation for Saving Zoë starring sisters and actresses, Laura Marano and Vanessa Marano. Forever Summer (2011)- Compilation of Cruel Summer and Laguna Cove. Keeping Secrets (2012)- Compilation of Faking 19 and Saving Zoe. Tattooed Love Boys (2007) – short story in the anthology "First Kiss (Then Tell)" edited by Cylin Busby. Bring Me Back to Life (2010) – short story in the anthology "Kisses from Hell". Silent All These Years (2011) – short story in the anthology "Dear Bully" edited by Megan Kelley Hall & Carrie Jones. ^ Noël, Alyson. "Author's Bio: Alyson Noël". Archived from the original on April 19, 2012. Retrieved May 1, 2012. ^ "Publishers, Hollywood Take Liking to Laguna Niguel Author's Novels - Orange County Business Journal". ocbj.com. Retrieved February 9, 2015. ^ Noël, Alyson. "Publisher's Weekly: Q&A with Alyson Noël". Retrieved April 12, 2012. ^ Basheda, Lori. "Orange County Register: 'Immortals' Author thanks Troy High teacher". Retrieved June 21, 2010. ^ "Press Downloads: Fast Facts about Immortals Series" (PDF). Archived from the original (PDF) on June 2, 2012. Retrieved May 1, 2012. ^ Rachel, Deahl. "Series Optioned by Summit". Publisher's Weekly. Retrieved May 1, 2012. ^ Gomez, Alisha. "Publishers, Hollywood Take Liking to Laguna Niguel Author's Novels". Orange County Business Journal. Retrieved May 22, 2011. Wikimedia Commons has media related to Alyson Noel.